Written 6th September, 2015. For more information on why assisted suicide is not a good thing, please visit Care Not Killing, an organisation campaigning for better palliative care and resistance to assisted suicide laws. Many do indeed assume that some classes of people should be helped to die instead of to live. The reality that studies have consistently shown that people with locked-in syndrome do not want to die means nothing to someone who sees someone sick, dying, paralysed or disabled and just sees someone “who should be helped to die”. 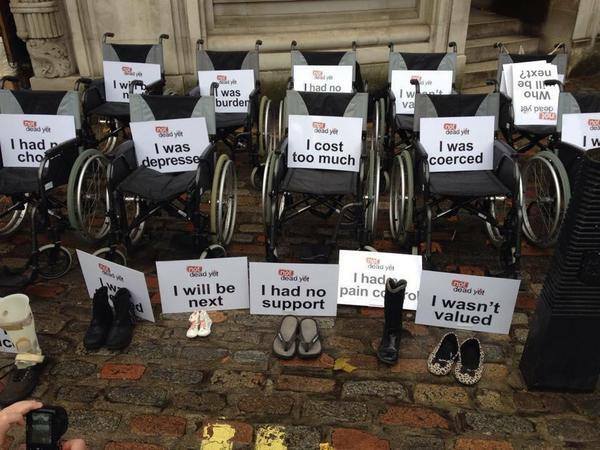 However you look at it, visible disability or suffering leads people to wish others dead. I don’t want a society where their feelings prevail over the wishes of the vulnerable and the dependent. Helping someone to end their own lives on compassionate grounds was decriminalised in 2010, so we do not need a institutionalised system whereby people are subtly put under pressure to not be a burden to their families and swallow the pills. or worse, not even being given the choice at all. Would you like to Come to the Best Conference in the World (about Autism)?